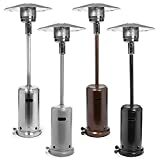 Patio Heaters are great to use for keeping patios nice and warm. They come in many different shapes and sizes, and they range in price. If you are interested in knowing what these top five units are, then continue to read the rest of this review. By the end of this review you will know which unit is the right one for you. Our favourite patio heater is the Fire Sense Commercial Patio Heater. 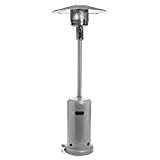 It provides a great heat output (enough to comfortably heat up to about a 10 foot diameter), and is more reasonably priced than most similar heaters. It does not matter what the size of your patio is, this will do the job. With the double mantle heating grid, the design, the safety features and portability, you just cannot go wrong with this unit. 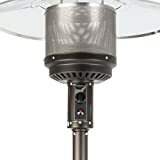 It's not just the best in our opinion, it's also Amazon.com's best selling patio heater. It is stylish looking too, thanks to the mocha finish, and it is simple to ignite due to the piezo igniter. 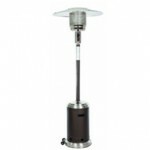 If you are big on power and design, then you will need this heater for your patio. This heater is a bit different from the others here, being both electric and of a compact design, intended to sit on your table top. It is rated at 1500 watts, and simply plugs into a power outlet. The manufacturer states this heater is good for up to 50 square feet. It weighs 22lbs, and comes with a 12 month warranty from the manufacturer. However, it just doesn’t look nice, it also works like a charm, as it is 41,000 BTUs, and it is powered by gas. If you are looking for a very powerful unit that runs and looks great, then this is the unit for you. The run time is also very good, as you can run it for about 10 hours. Best of all it is able to heat a wide radius (15-feet diameter), so you can rest assure that it will be able to provide your patio with plenty of heat, regardless of how big the area is. The heater comes complete with a Premium element cover included. It uses standard propane tank, which you will need to buy separately. There were no recalls listed for any of the patio heaters mentioned here at the time of writing (January 2019). However, it's always a good idea to check the latest information at the Consumer Product Safety Commission website before buying any large, expensive or potentially dangerous product. Do you own any of the patio heaters mentioned here? Did you choose a different one? Let us know in the comments!